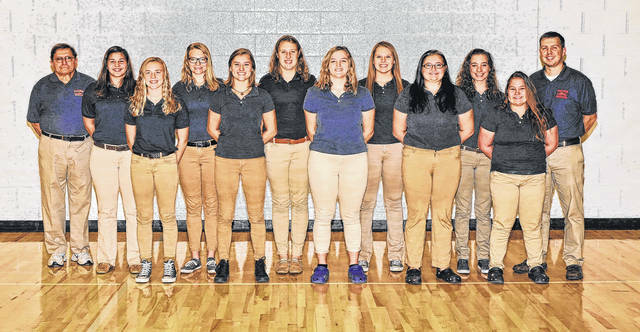 GALION — As the 2017-18 winter season approaches, the swimmers for Galion High School look to continue a long run of success in pools throughout Ohio. The Tigers will do so with head coach Ted Temple once again leading the way. They also return an abundance of talent returning from last year’s teams. Temple is entering his 25th season as the leader of the Galion swim teams and will once again be joined by assistant coach Curt Wiggins. Galion’s boys squad won its third straight Mid-Ohio Athletic Conference title last season in Marion, defeating runner-up Harding; 183-80. From the team a year ago, Temple returns 12 total letterwinners, eight district qualifiers and three state qualifiers. Those returning will be called upon to lead the youthful Tigers and continue their ways as specialty swimmers throughout the winter. Sam Rigdon and Luke Eisnaugle will be the seniors leading the way for the Tigers’ boys squad this season. Rigdon is a school record holderand last year was an all-county all-star, first-team MOAC swimmer as well as a district and state qualifier. Eisnaugle was one of the many Tigers to qualify for districts competition last winter. Clay Karnes, now a junior, also earned school records, and all-county nod and first-team all-conferenceshonors last season en route to qualifying for districts and advancing to the state meet. Sophomore Caleb Strack, the team’s other state qualifier, is first-team MOAC epresentative and school record holder. He also will be back in the orange and blue for Temple. Other district qualifiers returning are: Junior Weston Rose (second-team MOAC) and sophomores Ben Alstadt (second-team), Alec Dicus (second-team) and Braxton Tate. Other expected varsity swimmers are: Junior Wyatt Enders and sophomores Thomas Mogan, Issac Niedermier and Darren Brooks. Galion is vying for their fourth straight league title and will do so with the loss of two-time state qualifier and MOAC Swimmer of the Year Eli Skaggs, state qualifier Landon Rose (first-team MOAC) and district qualifier Lucas Conner (second-team). For the Lady Tigers, they have finished as the runner-up behind the Pleasant Lady Spartans in all three years in the MOAC. If the Tigers hope to overthrow the Spartans, they will have to be do itwithout the help of standout Bri Wallis, who graduated in the spring. But, Galion does return nine letterwinners and three district qualifiers from last year’s squad. Allison DeNero and Elise Barnhart both qualified for the district meet a season ago and will be back for their senior seasons . DeNero also swam her way to an all-county all-star nod last season and both girls earned first-team all-conference honors. Joining them will be the third district qualifier and a first-team all-conference honoree junior Sari Conner. 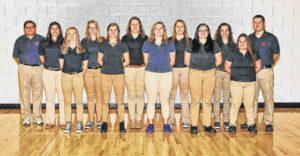 Other expected varsity swimmers for Galion are: seniors Katlyn Kuehlman and Bri Streib, juniors Danielle Schneider, Allison Bauer, Ashleigh Wright and sophomore Harmony Lohr. With the addition of Ontario to the league this year, it looks to be a three-way battle for the top spot in the MOAC with the Lady Warriors, Pleasant and Galion. Galion’s first test of the year also happens to be their first meet of the year. On Tuesday, Nov. 28, the Tigers’ squads will host the visiting Ontario Warriors at the Galion YMCA.